Kathak means a school of dance. It is also the name of a community of dancer. The word sounds simple, but it has a long history, which throws light on the position of classical dance forms in the north of India. In ancient time, the knowledge of epics and mythology was conveyed to the people by certain class of professional story tellers named “Kathakas”, Granthikas, Gathakas, Pathakas, etc. The sage Valmiki in the Ramayana gives some indication of a class of recitors who specialised in the art of story telling. The reading of Ramayana by Lava and Kush as Kushilavas may be cited as an example. The word Kathak is also mentioned in the epics of Mahabharata. It is referenced in the context of actors, singers and dancers. As a class of story tellers, Kathakas are said to have flourished in Bengal. Vidyapati- the dominant force of medieval Vaishnavas in Bengal and Assam, had a music companion, Jayat, who is said to be a Kathak. Tulsidas, the author of Hindi Ramayana has referenced Kathak in his writing – in the context of dance. Etymologically – the word Kathak is related to Katha- the art of story telling. According to some authentic Sankrit lexicon Kathak or Katha means composition of a literary piece. In the book “Abhindra Rajendra”, the Jain lexicon, the corresponding word is “athya” or “kathya” – meaning a music composition. In Sanskrit literary works, the word Kathaka can be found in the grammatical works – that Sanskrit lexicons documented in ancient times. Panini has written in his “Siddhantha Kaumudi” – a Sutra “Kathadibhyaghtahak” from which the word Kathika was derived and is translated as one well versed in story telling. The word Kathaka occurs as ‘Kahuga” in the Jain lexicon- Abhindra Rajendra and Kappadridkosha and its definition given by them is almost identical with the Sanskrit meaning. In the dictionary of Pali language Kathika is used in the sense of a preacher. In the Nepali dictionary the same word is interpreted as a narrator or recitor. The North Indian classical dance form prevalent in the north Indian states of Uttar Khand and Rajasthan is Kathak. Swami Haridas is accredited as the pioneer of the Kathak dance form. During his time Kathak started to became an established dance form in the temples. Bhajana, kirtana, dhrupada and katha were acted out in temples in the Kathak form. However the dance became a popular art for m only after its introduction ino the royal courts. The royal courts treated the dancers with immense respect. The Nawabs of Lucknow and the Kings of the Jaipur court were great patrons of this dance form and invited prominent dancers of their time to their courts. Kalikaprasad, Bindadin Maharaj, Pt Jaylal, Nrityacharya Narayanprasad are some of those artists who have come to prominence at these royal courts. Due to this linkage with the courts- the primary Rasa in Kathak dance form is “Shringar”. Kathak dancers are accompanied by percussionists playing the Tabla or the Pakhawaj. Primary dance compositions include Toda, Paran, Paran Ahmad, Tatkar etc. 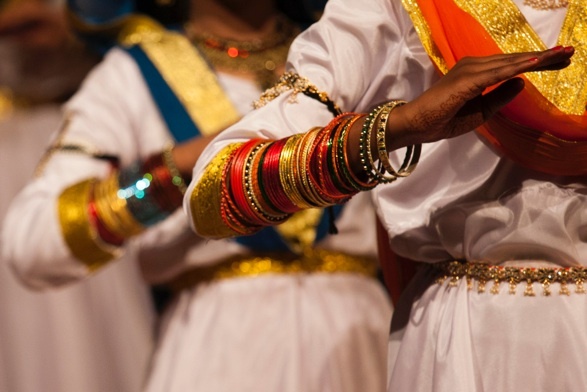 Songs, words and acting accompany the Abhinaya style of dancing called the ‘Gat Bhav”. The footwork is an integral part of the Kathak dance- this is called the Tatkar. Primarily lahenga, choli, orni, angarekha, churidar etc are worn by the dancers during a performance. Some of the present day artists of Kathak include Pt Birju Maharaj, Saswati Sen, Chitresh Das, Rani Karnaa, Rubi Bandopadhay etc. One of the chief exponents of the Lucknow gharana of Kathak was Bindadin Maharaj. Bindadin was a great devotee of Lord Krishna and it is said that he once had a vision in which he saw the Lord, who charged him with the duty of propagating the art of dance. Bindadin composed scores of thumris, dadras and bhajans and these have since become an integral part of the “nritya” context of Kathak. The chief exponent of this form of Kathak, Bindadin was a devout person. The dance form that came into custom at this time attempted a compromise between Hinduism and Islamic ideology, it became secular in nature but did not divorce itself from the Krishna- Radha theme. “Bhava” or mood became the forte of the Lucknow dancers. The wanted to see the art which mirrored life in all its moods, which projected life with all its passion. The created many new “gats” or compositions and most of these are described in certain books which were written during the time of Wajid Ali Shah. The Lucknow dancers regarded the face as the supreme medium of expression and the eyes in particular as the mirror of emotion. In this way their dance became capable of expressing the subtlest nuances of emotion. This gharana of Kathak we have seen attained maturity as well as perfection in the court of Wajid Ali Shah. Before him, there was no tradition of dance in Lucknow, at least not of any stylised mode of the art. Thakur Prasad, a Kathak dancer migrated to Lucknow in the beginning of the 19th century and became the court dancer of Wajid Ali Shah. Some contend this view, according to the contenders, Thakur Prasad’s father Prakashji came to Lucknow during the reign of Asaf-ud-Daulah and enlisted himself as a dancer in the Nawab’s service and in this way laid the foundation of the Lucknow gharana.